Today’s project completed – Love it when a plan comes together!! 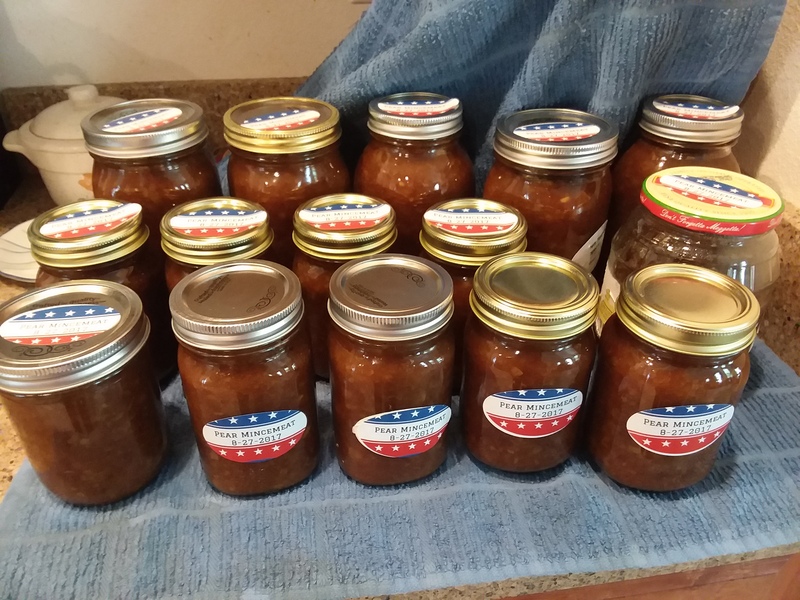 Today’s project was to make and preserve a big batch of pear mincemeat. Mom used to make this and it was so yummy that i had to try it myself. 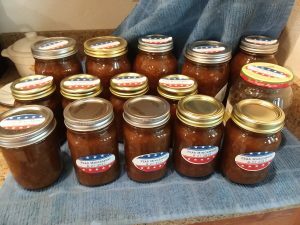 Credit for the recipe actually goes to the Farm Journal Canning & Freezing cookbook (not sure of the date but its been out for years). So 15 pounds of pears, 4 pounds of raisens, 13+ cups of sugar, a bunch of oh-they-smell-so-good spices and lots of chopping and cooking later here is the result. 5 quarts , 9 pints, and one pickle jar all done, sealed and labeled. Yes it is a lot of work and required lots of standing whilst cutting, chopping, etc. I did use the meat grinder on my kitchen-aid mixer to do the fine chopping but the rough chopping was all done by my hand. The house still smells like the spices even hours after I was done with the batch. All of these things, not to mention just seeing the jars all sealed and in rows makes me happy. It is such a feeling of accomplishment to preserve foods which I know my family will enjoy later. I print my own labels using Avery’s online template and print feature. One can save the labels but as I don’t make the same thing again on the same day/same year often I don’t bother to save and heck it takes no time at all to make up new labels anyhow. Thanks Avery for this great service!